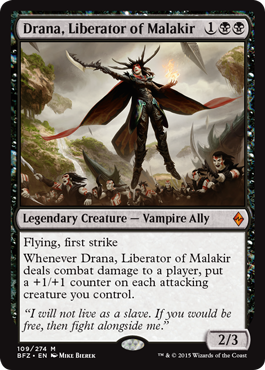 When Kalitas and the Ghet threatened to turn all of the vampires of Malakir into thralls of the Eldrazi, Drana struck back, retaking control of Malakir and driving Kalitas and his traitors away from the city. But Drana's victory was short-lived, and she and her remaining people were driven from the city by ever-growing hordes of Eldrazi. Their numbers have swelled with thousands of mortals who have no choice but to join them or perish in the face of the Eldrazi assault. They are the last remaining bastion of civilization on Guul Draz, and they wander the face of the ravaged continent in search of hope or succor in a world that has vanishingly little of either. Against a sky the color of dead trees, a flock of birds dropped out of the air. No force impeded them, no arrow or spell punctured their flight. They just stopped and died, their lifeless bodies ceasing to carry on. Drana thought they had simply given up. Perhaps it was the reasonable choice. Around her, enormous sleds groaned and buckled under the weight of thousands of refugees, vampire and mortal alike. Each sled was tethered to hundreds of the nulls, slavering and gibbering as they moved forward, ever forward. They were no longer moving toward something. Just away. Away from the Eldrazi, away from certain death. But each day there were fewer places to go in away. 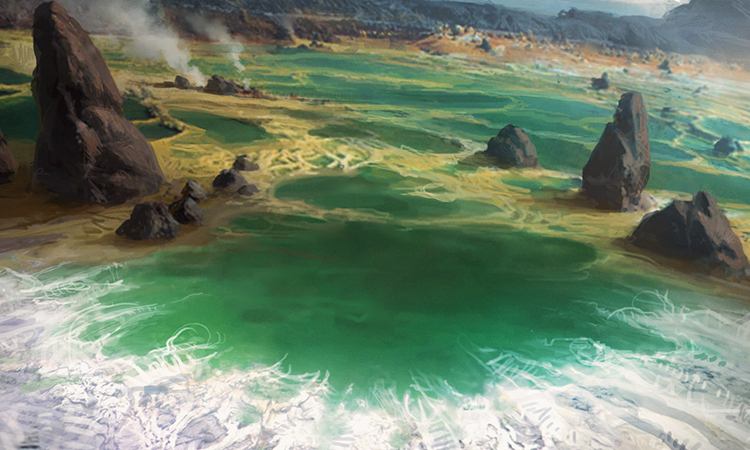 The land of away, here in Guul Draz, was being replaced by the presence of more Eldrazi. Drana ascended through the air, a survey she knew would offer no hope, but she flew nonetheless. Six giant sleds, plus small scattered bands of vampire scouts and outriders and the few mortals who were still combat-ready. Fifteen thousand lives, at most, and perhaps a fifth of those worth more in battle than the delicious blood they carried in their veins. 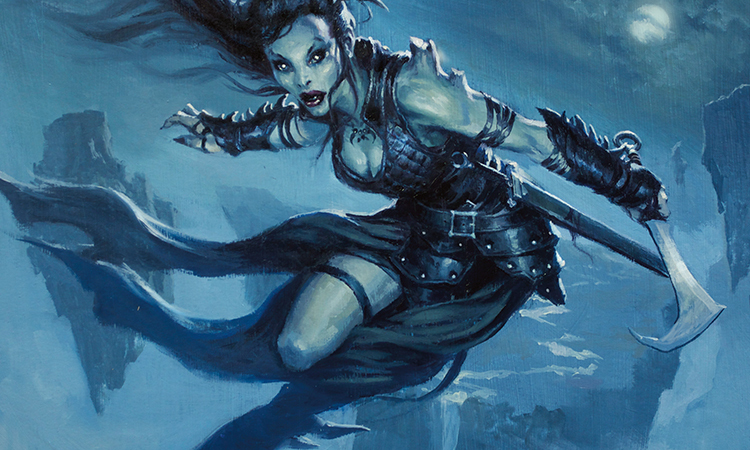 Back when they had first liberated Malakir from the traitorous vampires who had succumbed to the Eldrazi's call, back when they still thought this a winnable war, they had over three times that number—the vast majority of them useful vampire warriors. Drana rose higher to view the large Eldrazi host behind them. She wanted to say there were thousands of them, but she did not like lying to herself. There were many more than thousands of them, a number so much greater that it was not useful to label it. There in the midst of the host was the enormous Eldrazi sire, towering over the neighboring hills, the clear lord of its domain. The sire was not as large or formidable as Ulamog itself, but it was still massive and powerful enough to lay waste to the continent of Guul Draz. Its multiple limbs waved a constant orbit in the high sky. The vampires had lost many to its rending arms in aerial assaults before the futility of such attacks became clear. The Eldrazi host was massive and the host was inexorable and the host was death . . . but at least the host was slow. At times the sleds had pulled many miles in front, so that the pursuit was no longer visible. But there were smaller Eldrazi hosts that had come from both left and right, and in the angling back and forth to stay clear, Drana's force had allowed the pursuing host to catch up. Now the vampires were only a couple of miles ahead, and they were running out of room to maneuver. Soon they would be at the coast, and their only hope would be to double-back and . . . stay alive today, Drana reminded herself. That was the new goal. The only goal. Stay alive today. The goal grew more difficult every day. Eldrazi were everywhere, and the land she had known for thousands of years was evaporating underneath. Neither rock nor wood nor life resisted the chalky calcification that was the residue of the Eldrazi assault. Drana thought of the corpse of the land, being drained of essence and blood to feed the insatiable hunger of a merciless predator. We were made in the shadows of our makers, she thought, not for the first time. Not in image but in action. The painful truth, the essential truth, was the Eldrazi were better vampires than the vampires. She turned to look toward the coast, their current destination. There, beyond the narrow waters, was Tazeem. Some of the vampires felt there would be refuge there, but more, including Drana, felt there was no reason there should be different than here. 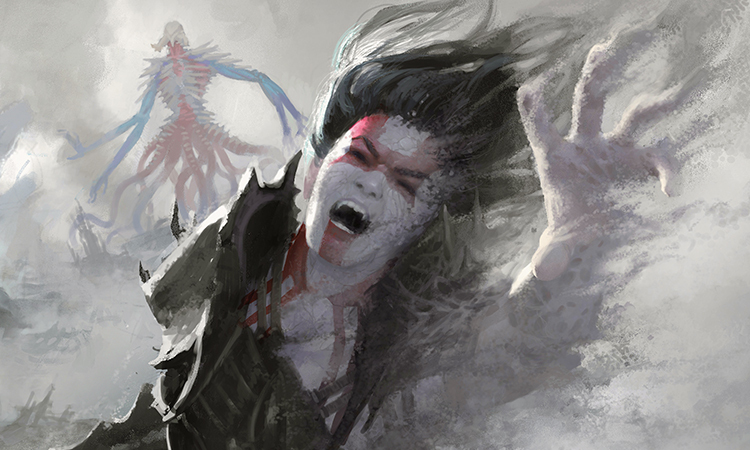 If vampires, the most powerful race on Zendikar, could not defeat the Eldrazi, what chance did lesser beings have? But every day a few more vampires left, carrying a foolish hope that sanctuary existed somewhere. She spied a dot on the horizon, and the dot split into five dots, ten dots, then more. From the direction of Tazeem they came, and several vampire scouts flew off to get a closer look. An overseer flew up to join her. The dots resolved into clearer pictures. There were maybe a hundred of them. "Those are kitesails. Kor." "Welcome or kill?" Kan had been one of her personal overseers for millennia. He knew the ways she thought, and she appreciated his laconic efficiency. Still, he sounded tired. She was tired. She had existed for thousands of years, and though she could not remember more than a fraction of that life, she thought she had never been so tired. A new experience. She gave a tight smile. I should be grateful. "Welcome. They come to join us at the end of the world. We will be accommodating." The leader of the kor delegation was tall, thin, but with a good amount of lean muscle. A warrior, as were the rest. Drana could smell the blood, the delicious scent of the healthy. She had not fed in a few days, and even that sustenance had been the blood of the dying and infirm. These kor smelled beautiful. She smiled widely, and she gave credit to the kor leader when he did not step back, did not even reach for his sword. Brave blood tasted best. She put the regret of not being able to taste it on her list of regrets since the beginning of the Eldrazi rise. It had become a long list. The leader's name was Enkindi; he and the rest of his band had been sent by Gideon from Sea Gate to find other survivors on Guul Draz and bring them back to join Gideon's army. Drana had heard of Gideon from a few of the recent stragglers to join their camp. 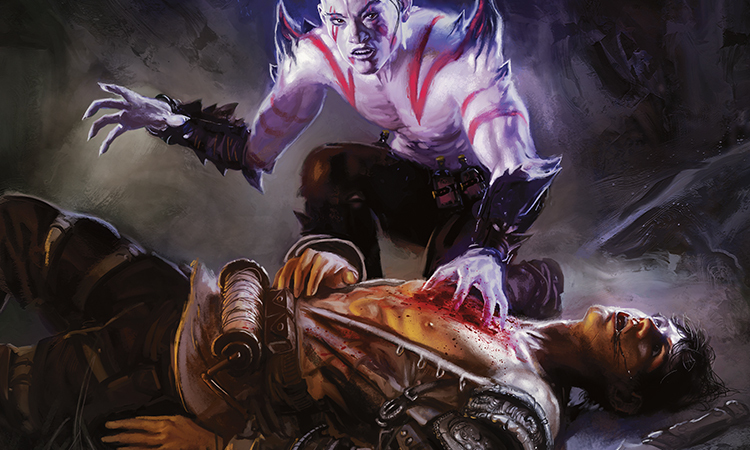 The rumors were that Gideon was a powerful human mage and warrior, but when Drana asked if he had defeated the Eldrazi on Tazeem, they could only reply, "No, but he survives." Drana could not see anything special about this Gideon. That's what they all were doing, surviving, until the time came they stopped. Do not stop today. But it could be tomorrow. Still, if this Gideon could afford to send a hundred capable troops looking for allies on other continents, he was doing better than her army. But in the end, that didn't matter. That these kor could fly might. The giant sleds had stopped. Vampire overseers walked among the nulls chained to the pull-rods, slopping out handfuls of decaying meat from large buckets. The nulls were the easiest to feed; the rest of their entourage less so. Mortals shakily left the sleds and were handed food in slightly better shape than what the nulls were eating. By this point there was no more fighting and rioting from the mortals over food. They were too exhausted to fight. But not too exhausted to stay on the sleds. Everyone who could moved away from the sleds. They had learned. As her vampires ranged amongst the sleds, getting what little nourishment they could from the dead and dying, she walked the kor through the thousands of refugees. There were still a few mortals who had both reserves and compassion. Mages, healers, warriors, they would walk amongst the huddled groups offering what succor they could. But everyone knew it was the vampires keeping them alive. Hunters and scouts were constantly foraging in a wide radius, bringing back everything resembling food they could. There was diminishing sustenance left in Guul Draz, though. Now when the scouts returned, they brought back little. More often they didn't return at all. "You are dying, here." Enkindi's voice was rough, clipped. There was no judgment in his voice, though, just an observation of facts. Still, Drana's voice carried an edge. "We live today." Though as she looked at the dirty faces surrounding them, visages absent hope or spark, she knew she stretched the meaning of "live." "Yes, today. But to what end? Where does this end? Gideon believes we can make a stand. That if we all stand together, we can. . ."
"Win. We can win. Many of you are still strong. We know what you can do in battle. Join us." "And what are we to do with them?" Drana gestured toward various clumps of mortals who huddled with each other, faces turned to the ground until they heard the call to get back on the sled. No faces looked up. The mortals had no desire to gain the attention of any vampire. Drana understood. Eating the dying mortals was the best compromise she could enforce on her people, and if the mortals thought it horrible, it earned her no favor with those she led either. "I. . ." Enkindi's voice faltered. "I don't know. But they are going to die either way, unless we can beat the Eldrazi." Drana led them toward a large group of small people on the outskirts of the sleds. There were a hundred of them, probably more. Here and only here were there signs of movement not strictly pertaining to survival. Many of the small people were still and huddled but some of them ran and played and shouted. Only here had Drana posted several guards, her best and most trusted guards, ringing the group—watching for any potential harm. Eldrazi were not the only threat. Though the vampires had not attacked any healthy mortals under their care, at least not after the first transgressors had been punished fatally, she had posted the guards anyway. "Children. They are. . ." Enkindi's voice had faltered before, but here it broke. Perfect. "No, not children. Warriors. Like you." Drana's voice was languorous, soft and velvety, just as before sinking her teeth into prey. If she could not enjoy actual blood, at least she could enjoy the hunt. "Melindra, come here." She did not shout, but her voice carried. One of the smaller children broke free from running and came over to Drana and Enkindi. Her hair was clipped short—shorn with a dagger, either by herself or one of the other children. She bore the same angular cheekbones and pale skin as Enkindi, marking her as kor, but there the similarities ended. Her face was filthy, and her clothes torn and ragged. Drana brought out a small piece of meat and palmed it to the child who gulped it down and smiled. Melindra had a beautiful smile. "Are you children, Melindra?" Drana's voice continued its soft melody. "No. We're soldiers. We're a brigade, you said. We're the Orphans' Brigade. You said we got to name ourselves, and we did." As she spoke, Melindra whipped out a dagger from a home-made sheathe, all ragged rope and hide. But the dagger was sharp and oiled. "You said. We get to choose. We're the Orphans' Brigade." "And so I did, Melindra. And so you are. The Orphans' Brigade." She patted Melindra on the head, and Melindra looked up at her and smiled again. Enkindi looked at the child, and back at Drana, tears and anger in his eyes. "They are children! Kor children. . ."
"And humans and merfolk and elves. All mortals are mortal. Becoming a parent does not seem to provide adequate protection against death." "Do you actually use them to fight? How evil are you? They are. . ."
"Children, yes." She continued to stroke Melindra's rough-hewn hair. "Being a child seems no more protection against death than being a parent. This is war. In my experience, wars are usually very effective at killing children. Perhaps that's the point of war, to kill children." Enkindi's hand started to flex and tremble, just a bit. His eyes tightened as his tears stopped. Drana had to be very careful here. She could not provoke him so far yet. "Except in this war, Enkindi, against the Eldrazi, we are all children." Enkindi's shoulders slumped, and his hand stopped flexing. He looked up at her, clearly lost. How do you save the unsaveable? "I will not leave them to the Eldrazi. I will not leave any of them. You ask me to go across the narrow ocean to fight with this Gideon, to kill Eldrazi there instead of Eldrazi here. To save those children, but not save these children. I have a different proposal. I'll leave with you to fight with Gideon at Sea Gate, if you and your warriors fight with me first. Help me kill the Eldrazi behind us, who even now slither closer in their hunger. Help me win my battle, and I'll help you win yours." She stuck out her hand, in the way mortals do, and successfully resisted the urge to bring his neck close and bite when he offered his hand in return. It was extra flair for Melindra to sheathe her dagger and stick out her hand in the same way, but Drana loved the child a little more for it. Drana sent her lieutenants to begin preparations, and she arranged to meet with Enkindi in the air. They had a battle to plan. The sun managed to show itself in the early afternoon, its light wan and pale. The Eldrazi seemingly sucked the energy from everything, even light itself. The battle plans had been drawn quickly. One of the few advantages to fighting against innumerable odds and a mindless, inexorable foe was that battle strategies were straightforward. Every day, every hour, her army weakened. Better to strike now. A buzz ran through the masses. After so many days of running and death, here would be a chance at resolution. No matter the outcome, tomorrow's reality would be different than today's fear. She was not prone to careful introspection, but it was hard not to acknowledge this could be the last day of her existence. She had been alive for many thousands of years. But even several hundred years into that life she realized she had a choice. She could dedicate herself to remembering her past, every new day an exercise in keeping hundreds of years of memories alive, or she could . . . let go. She had chosen to let go. Memories for the long-lived were a delicate edifice of pebbles. Pebble stacked upon pebble upon pebble. She could roughly trace the largest pebbles, but after so many years, everything in her foundation, in her earliest times, was buried. She wanted those earliest days, knew they would be essential to the vampires surviving this war. Today she would get those memories or she would die. She welcomed the prospect of clarity, regardless of the form in which it arrived. Her opportunities for clarity were approaching on all three sides. The main Eldrazi host, centered around the enormous sire, came from due east. Two smaller hosts converged from the north and the south. She had placed the bulk of her army to engage the large host. The majority of that contingent was vampires supported by mortals she could trust in battle. Those mortals too fractious to reliably follow her orders were placed in charge of the frail and infirm. She didn't bother giving instructions of what they should do if the army failed. They would find out soon enough in the very short time left to them. Drana's best overseers managed the few hundred fliers they had left. Her fliers, along with Enkindi and his additional hundred troops, would be key. Drana kept her eyes on the Eldrazi sire. It was both the main challenge and opportunity in this battle. They could kill all the other Eldrazi they wanted, but if they could not find a way to bring the sire down, none of the other deaths would matter. And they had no chance of killing the sire without fliers. The Eldrazi were close. There were thousands, tens of thousands, more; different shapes and sizes running, crawling, slithering, slurping their way across the rocky ground, here on the outskirts of Guul Draz. Some even flew, their misshapen grotesque bodies an affront to Drana's domain. Occasional ripples surged through the masses and Eldrazi bodies would explode or be swallowed up into the earth. 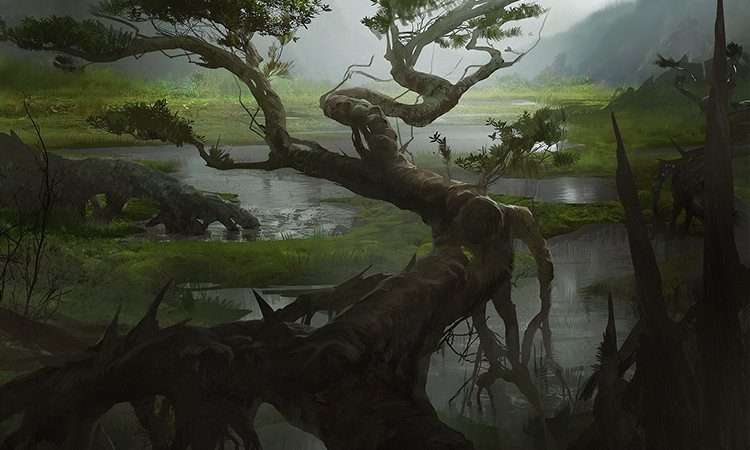 It was Zendikar itself rippling to rid itself of the foreign invaders, using the roil to fight its war. But the weapons of the Eldrazi were more fearsome. Everywhere they touched life, life died. Everywhere they touched matter, matter disintegrated. Everywhere they touched the world, the world buckled. They are the end of all things. The Eldrazi came upon them. Mortal and vampire alike met the initial onslaught with a fierce savagery. They blasted, hacked, and tore their way through the unthinking nodes of hunger embodied in gelatinous, tentacled forms. All the fear and despair of the last few weeks was converted to raw fury and power. If these were their last moments of life, they would be epic moments; moments worth a thousand years of story and song to commemorate. The Eldrazi did not care. The Eldrazi kept on coming. An Eldrazi drone lashed a barbed tentacle at her head. She bit through it and caught the free appendage, whipping it around to decapitate another Eldrazi behind her. The headless Eldrazi didn't know it was dead, mauling an open-mouthed mortal, sucking him in and eviscerating him in a single undulating motion. Two other mortals fled in terror before being killed by more pressing Eldrazi. Drana chopped an Eldrazi in half with her sword and then spun to punch through the body of another. Drana snarled as she did it, a feral, manic grin on her face. But no Eldrazi ran in terror. So much of the momentum in battle relied on creating fear and intimidation amongst your opponents; once the mind succumbed, the body followed. That approach was useless against the Eldrazi. The only available tactic was killing. The Eldrazi broke through the front lines, penetrating deeper into the heart of her forces. More Eldrazi came behind them, and more waves were behind them, always advancing. There were too many. Killing would not be enough. Drana needed to pursue her other path to victory. 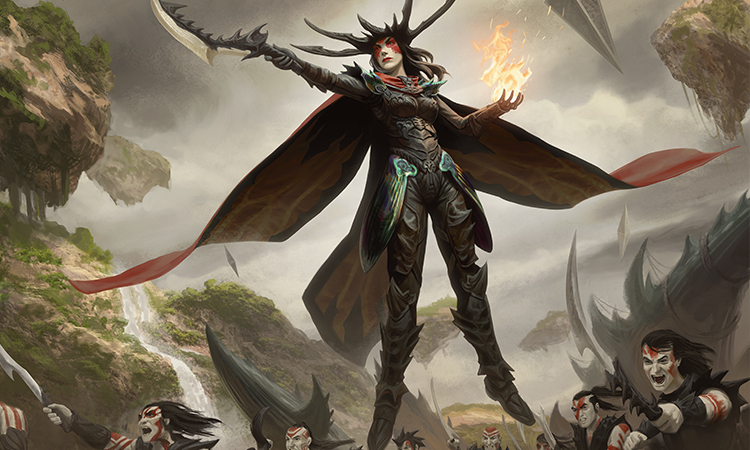 She rose high into the air, where Enkindi and his troops swooped and glided and tore flying Eldrazi to pieces with their sharp hooks and swords. Drana admired the efficiency and effectiveness of the kor kitesailers. They clearly had much practice killing Eldrazi. Drana hoped they would be competent enough. "Kan!" Drana shouted at her overseer, whom she had kept close to Enkindi's forces. "Mobilize the Orphans' Brigade. Send them toward the sire!" Kan flew down without a word. Enkindi was also close enough to hear. He veered his kitesail in a wide loop to face Drana. "Monster!" His face contorted in anger and disbelief. He ripped his sword through an attacking Eldrazi, its gelatin droplets torn asunder and falling to the ground below, his face on Drana's throughout. "You send those children to their deaths!" His screams wanted to rip her apart, but no hand of justice came from the sky to do his bidding. Drana would welcome such a hand, as long as it killed the Eldrazi as well. "We're all going to die. Better to die while trying to win. We need to kill that sire, or we have no chance. The children will serve as necessary bait to lure the sire where we need it to be." She was calm, peaceful. Every word she said was true. The easiest lies were those that were true. Fifty feet below, the mass of children moved closer to the front lines, ringed in front by her vampire guards. They had never yet intentionally known combat, though each child had experienced battle; every survivor had by this point. The Eldrazi did not care about intentional combatants. Enkindi swayed in the air, rocking back and forth. Most of his people had gathered close to their leader, sharing his disgust, fear, and hate. He looked at the Eldrazi sire, one hundred feet tall, limbs coming out of limbs coming out of limbs—an impenetrable fortress in the shape of a single giant Eldrazi. Drana imagined the calculations going through Enkindi's mind. Surely he knew what chance they had against such a being. They all knew. Hatred and despair warred on Enkindi's face as he came to his decision. She applauded his hatred. He deserved better. His snarling voice rang in the wind. "May your death be painful and long. May your death bring neither peace nor redemption." He turned to his group. "To me! We must take down the sire!" 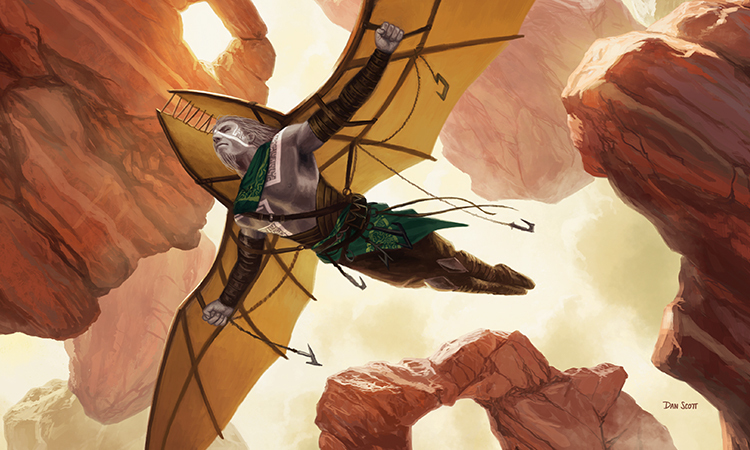 They fanned out as a group, angling their kites up and up to seek their fight with the Eldrazi sire. Drana followed behind, not too close, preparing herself. She had only started to hope when she first saw the kitesails on the horizon earlier today. They were a possibility, a hope, one she had lost after the very first major battle with the Eldrazi weeks ago on the outskirts of Malakir. Her vampires were fearless, strong, relentless, and ferocious in combat—but thousands of vampires could never contemplate doing what a hundred kor might: sacrifice themselves for the good of others. Enkindi led the charge directly into the head of the Eldrazi sire. Drana understood the plan. The head and neck of the creature, or at least those appendages most closely resembling those equivalents seemed the most vulnerable to blade and rupture. 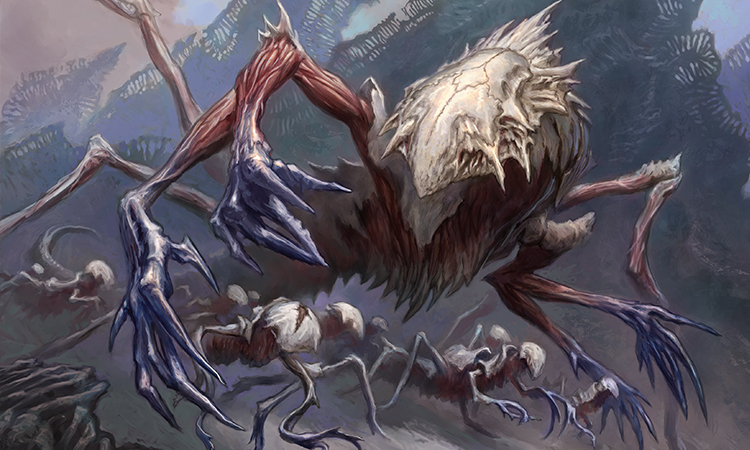 Though Enkindi and his group were moving fast, the Eldrazi moved faster. 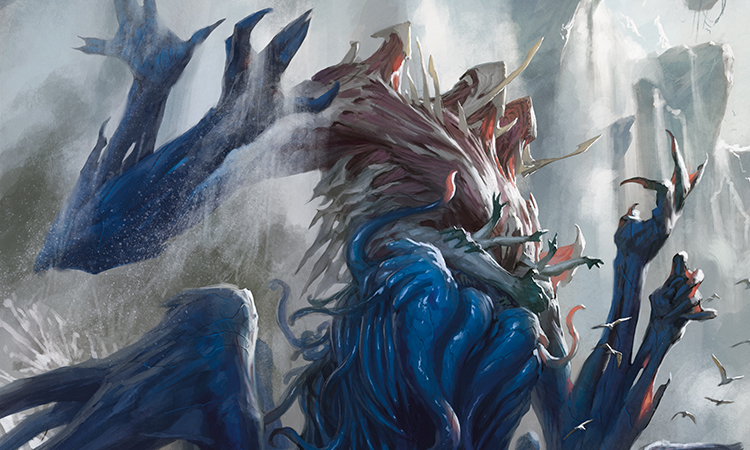 A large tentacle from the Eldrazi's head wrapped itself around Enkindi while a smaller attached tentacle wrapped itself around Enkindi's head and squeezed. Enkindi's headless corpse, still attached to its broken kitesail, plummeted uselessly to the ground. 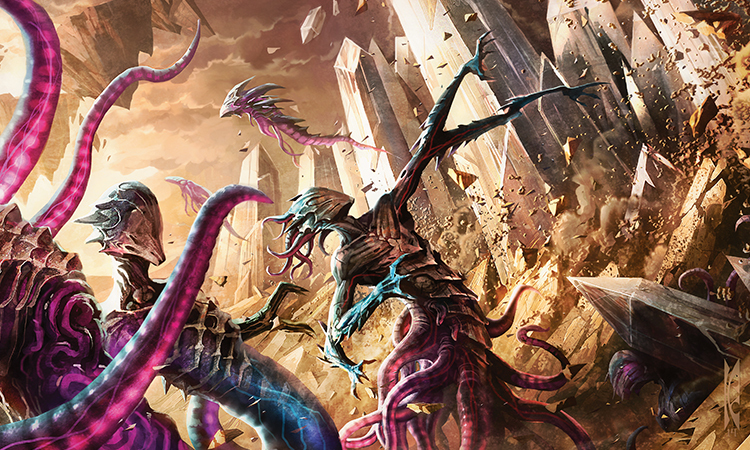 The kor were being slaughtered as the Eldrazi sire's numerous appendages lashed and pummeled them out of the skies. Drana grabbed one of the falling kor midway before hitting his fatal destination. He was still alive, though unconscious and not long to live. She bit deep through his neck; and his eyes shot open, then closed. It was one of most exquisite tastes she had ever enjoyed, suitable for her last feed. She drained him utterly, letting his desiccated flap of skin waft gently to the ground. She needed every mote of energy for what was to come. She summoned the last of her reserve and cast a spell as she gathered speed toward the Eldrazi sire. Only a few kor were still flying free; the rest were dead or being grappled by the sire. The giant Eldrazi, even distracted by all the kor, could still move blisteringly fast. But this time, Drana moved faster. She flew straight into the center abdomen of the monster, puncturing gelatin, flesh, and muscle into the very heart of the creature. Her world exploded. The spell she cast allowed her to see more, to see energy and patterns normally invisible, even to one such as her. The energy was odd, alien, with a sickly magenta taint, but it was everywhere. I am the hunter. I am the predator. Everything is prey. Everything is mine. She had been so thirsty. 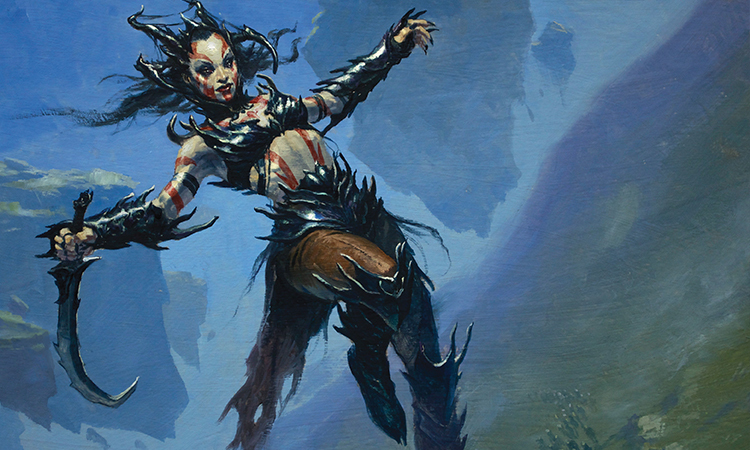 She thrust her mouth into the beating magenta heart of this monstrous Eldrazi and she drank. She drank deep. Clarity blossomed. In the beginning, in the very beginning, there was hunger. That was all there was, this hunger, this want, this need. Our purpose was to consume. We needed legs and eyes to find prey. Arms and teeth to grab prey. Minds and strength to overcome prey. We consumed and used the energy we gained to consume more. The mission was clear. It was not clear in words. The words came later, a poor translation from truth to brain to words, those imperfect messengers of need. It was clear in her bones. You will consume. You will scour clean. The remnants of the broken must be consumed and cleansed. She didn't know what was meant by broken, what the Eldrazi even thought of as whole, so they could compare and know what was broken. Perhaps to those monstrosities, everything that was real, that was the world, was broken. She drank deeper, deeper. The energy from the large Eldrazi flowed into her, suffused every starved pore in her tightened flesh. The Eldrazi sire had a huge hole in its chest where she had burrowed, but it was still upright, still killing, still marching upon her people. She needed more. Consciousness, a sense of me separate from the hunger, took years. Perhaps hundreds of years, though how could I know? The realization of consciousness came in waves, descending streaks of insight separating me from my hunger, me from my master. I was no longer an extension of it, of the consuming force named Ulamog. I was me. Drana. But before separation, there had been an . . . unease. An unease that was part of her because there was no her, only the totality of Ulamog in many different forms. An unease that only later, in those dawn moments between being Eldrazi and being Drana, before she forgot it utterly, she understood a glimpse of a facet of a dream. They were not supposed to be here. They were supposed to be away. Somehow, there was an away from Zendikar. There were many aways from Zendikar, and the Eldrazi knew, in so far as they could know anything, they should be there, and not here. But they were here, and their purpose was to consume, and so they did. For a brief second she remembered those dawn moments, the confusing blur of an awakening self, and how strong her purpose had been back then, thousands of years ago. That purpose washed over her, a giant wave of ocean crashing over her and subsuming her entirely. You will consume. You will scour clean. She was no longer remembering. She was becoming. The magenta alien energy she drank from the Eldrazi sire pulsed in her veins, no longer subject to her will. She was not devouring it. It was devouring her. Tentacles erupted from her back and shoulders, living matter created instantaneously in the shape of her masters, her makers. We were made in the shadow of our makers. The strange creature residing at the heart of the Eldrazi sire, a misshapen form on the precipice of utter transformation, screamed. It was a scream absent peace or redemption. It was a scream heralding the end of a world. Somewhere the shadow of a thought briefer than a heartbeat once calling itself Drana clung to a pebble of memory. The pebble said, I serve no one. The pebble glowed black, a proud glow, a glow with gravity, and it attracted other pebbles. The pebbles were struck by a burst of energy, toppling and scattering them. I serve no one. The pebbles reformed and coalesced into a shape. That shape emerged from the war between magenta and black light. The voice resonated throughout. I serve no one! I will be free! Drana reformed herself inside the Eldrazi womb. She drank in everything, every particle of the Eldrazi energy around her. She obliterated it and consumed it and bathed in it. The empty meat surrounding her exploded, leaving nothing but Drana floating in space observing the massacre below her. Her army was being routed, and even with the loss of the sire, the Eldrazi victory was nearly complete. This is what it feels like to be a god. Energy suffused every fiber in her being. She could obliterate armies, she could destroy the sun. With this power I could do anything. Her vision was boosted tenfold from normal. She could make out every face, every detail below. She saw the Orphans' Brigade, the outer rung of children attacked by the Eldrazi, while some of them fought and some of them ran and some of them died. She should leave them all. They could not help her. She could go directly to Ulamog and confront it, destroy it. Or she could find this away from Zendikar. Why settle with dominating a world, when there were endless worlds to own? The energy inside her bucked and writhed. Veins split open, too rich with power to be contained by any physical form. Her people were being destroyed. Should she save them? What matter these mortals, even her vampires, when worlds and gods awaited? She saw Melindra run up to an Eldrazi spawn and stab it in the head while she screamed. The Eldrazi spawn sputtered and shook, but still coiled a tentacle in reactive tension, and Drana could see the whiplash intended to shear off its assailant's head. I belong to no one . . . but they belong to me. Drana screamed as she let loose the energy stored in her body, becoming a glowing magenta sun in the middle of the day. Rays of purple light struck her people, vampire and mortal alike, healing their wounds, making them stronger, faster, invulnerable. The Eldrazi's tentacle struck Melindra in her shoulder and the tentacle shattered. Melindra laughed as she tore the Eldrazi's head off its body. She ran to kill the next Eldrazi. In seconds the battle changed, and what was left of Drana's army began obliterating the Eldrazi forces. The energy continued to pour from Drana. She had already lost more than half of the Eldrazi energy surge, and still she felt she knew no equal on this world. But her people needed more, and she gave it to them. Wounds closed, sickness fled, strength was restored. The energy was fading, surges becoming dribbles, each pulse emanating from her slower and weaker than the last. With every pulse she came closer to the ground, unwillingly but obeying laws of exhaustion greater than her ability to fly. There were no more Eldrazi in sight, all had been destroyed by her empowered army. The desiccated chalk patterns on the ground grew closer. They are beautiful. They are horrible. Then she hit the ground and found oblivion. "We can retake Guul Draz." In the millennia she had known him, Kan never sounded excited, but he did now. Excitement was the prevailing sentiment amongst the survivors, the two thousand of them that remained. They were healthy and refreshed, a combination of Drana's magic and the first taste of victory any of them had in weeks. Drana did not want to ruin their euphoria, but she knew the means of this victory was unique. She would not risk directly battling any Eldrazi the same way any time soon or ever. This time she had managed to preserve her identity, her very self. Next time, the results could be far different. "Any of the envoys left alive?" Kan shook his head. Enkindi and the rest of the envoys had served their purpose well. She had no need to honor their sacrifice, nor did she feel guilt about her manipulation. Such were the dealings with prey. But even so. . .
"Make preparations to cross to Tazeem. We are going to Sea Gate." Kan raised an eyebrow for a moment before turning around and barking orders. Several other overseers did the same. There were no dissenting voices. Any desire to reclaim Guul Draz was swallowed by their fervent obedience to Drana. She had saved them in their most dire time of need. Drana walked among her people, and all, vampire and mortal alike, bowed with her passing. Their heads looked up, though, searching for her eyes, their gratitude and pleasure clear. She met their gaze and kept walking until she found what she was looking for. Melindra was among the other surviving children of the brigade, sharpening her dagger with a whetstone. The child, though still dressed in rags, looked nothing like the ravenous waif she had been. She looked strong, hale, a warrior in truth. Melindra looked up, her face untouched by guile. Whatever she saw in Drana's face made her smile, and she went back to her whetstone and dagger. Drana had made the decision before losing consciousness in the aftermath of the battle. She had sought out the Eldrazi sire, sought its energy to unlock her own ancient memories. And she had found what she was searching for. The Eldrazi weren't from here. Perhaps they didn't even want to be here, for whatever want meant to them. But most important, there was a there for the Eldrazi to go back to. She contemplated what she would find at Sea Gate. She looked forward to seeing this magical warrior named Gideon, a strange man in strange clothes whom no one on Zendikar had ever heard of before now. Perhaps he came from this there, as well. They have a place to go. We can send them away to there. Or we can go away to there ourselves. Drana stroked the head of the child, and smiled.